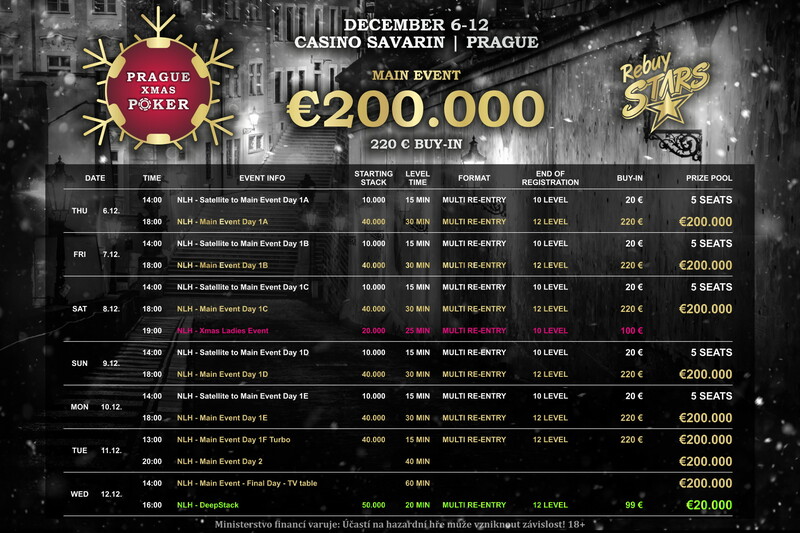 Prague Xmas Poker Main Event at Rebuy Stars Savarin offers € 200,000! From December 6th to 12th, Rebuy Stars Casino Savarin hosts the „Prague Xmas Poker“ special in the heart of Prague and for more than €220,000! The Main Event itself will be a contest of an incredible €200,000. 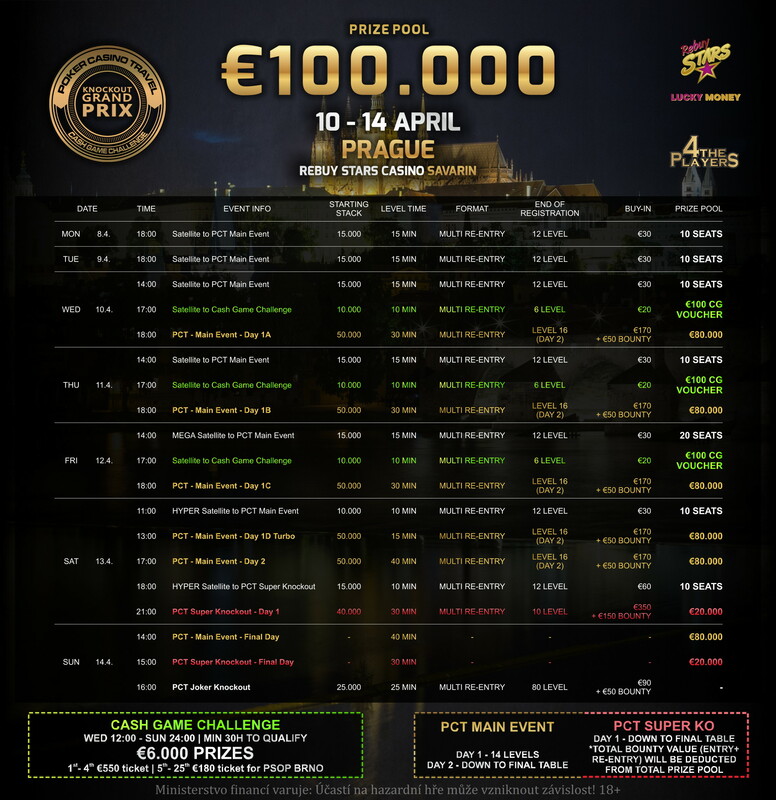 You can get in this challenge for a buy-in of €220. You can also get a chance to play for the fairy prize pool with satellites with a total guarantee of 25 Main Event tickets. The Xmas Ladies Event or Side Events will be part of the festival as for example, a popular DeepStack. Christmas will definitely be worth it! Main Event Prague Xmas Poker promises €200,000 to find under the tree! You will be able to play for the €200,000 prize pool from 6th December at the Savarin Palace. 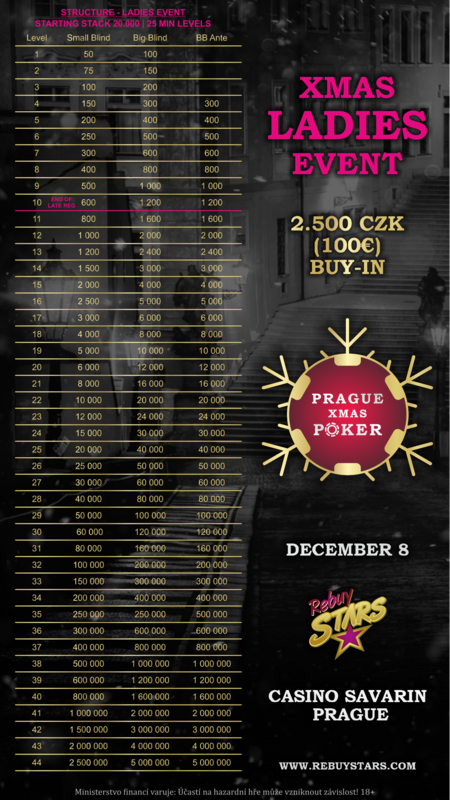 There will be a total of 6 starting flights at the Prague Xmas Poker Main Event. The buy-in is €220. Starting days 1A to 1E, from 6th to 10th of December, are starting at 6pm. Each level is always 30 minutes and the starting stack is comfortable 40,000 chips. The starting day of 1F Turbo for the Main Event is scheduled for Tuesday, 11th of December, starting at 1pm. Here the blinds change every 15 minutes. The second day of play, Tuesday, 11th of December, will run with ten percent of the remaining players from each starting day. A total of 12.5 percent of all entries will be paid. At least €340 will be paid as min cash. The prestigious final day will be held in front of the television cameras at Savarin Palace on Wednesday, 12th ofDecember, at 2:00 pm. Special Xmas Ladies Event for ladies and a DeepStack with €20,000 guarantee! The Xmas Ladies Event will start on Saturday, 8th of December 8, 7:00 pm. Buy-in is €100. Throughout the Prague Xmas Poker festival, you can also enjoy a wild cash game event, with a low rake in Savarin, CG tables are open 24 hours a day.